A group of around 100 students rallied this evening outside Senate House to protest the University’s forced eviction of student occupiers at Greenwich House last Friday. Protesters rallied around Senate House and shouted, repeatedly, “Cops off campus!” as security outside the Old Schools building watched on. Rally-goers chanted what has become a characteristic call of: “Whose University? Our University!”. The group cable-tied statements from staff, student groups and students decrying the forceful eviction to the fences outside the Senate House before proceeding to the front of Old Schools where they stuck more pro-divestment messages to the door. The statement cable-tied to Senate House was previously signed by 32 student societies, including CUSU, GU, and the BME, Women’s and LGBT+ campaigns. They then proceeded to the back entrance of Old Schools, setting off a bright blue colour bomb whilst members of Zero Carbon stuck messages onto the entrance's large wooden doors, banging loudly on its doors. Security guards behind the wooden doors were seen filming the crowd through holes in the door. A spokesperson for Zero Carbon said the rally was held to “protest the use of violence by the University” against students who had “exhausted their democratic processes” over the last three years. He also drew attention to the open letters that have been written by “over 140 academics” and many students in support of their cause. They have gathered more than 3,000 signatures altogether calling the university to “come to their senses”. He went on to say that “we will not go away” but will take “direct action” on behalf of those whose lives have been ruined by climate change, seeing as their democratic action has not been recognised by the university. He went on to say that the university “tried to repress our voices” which was met with cries of “shame”. Students came forward to address the crowd. One speaker, Dr Menza Qato, a junior research fellow at King’s, called for people to look at what the University has been doing over the last few years, claiming they have been “militarising” academic spaces, and that they “callously” brought a private company onto campus, using the “authoritative arm of force”. She claimed that this is “not the beginning of the militarisation” in the university, but the last chance to avoid it. Another, named Ayse Polat, spoke about what it means to “have a fully securitised and militarised university”. She referred to the 2010 occupation, the last time the University called on the police to remove students from their occupation of Old Schools, and drew parallels with a similar incident in a university in Istanbul which ultimately led to the police being a constant and intimidating presence on campus. She claimed there was a “very thin line” between preventing crimes and unnecessary preemptive responses, calling on students to be “very careful”. However, she also called for a “careful optimism” rather than “defeatism” in what she described as a “global war on democracy”. 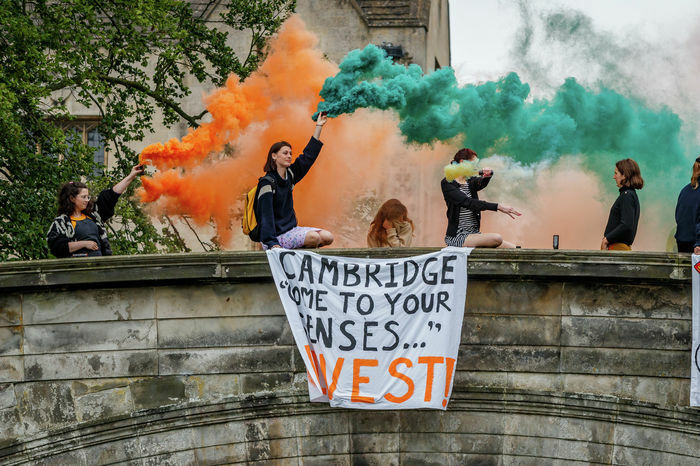 Today’s rally is the latest in a series of organised action by Cambridge Zero Carbon Society, a student-led pro-divestment group which has been lobbying and protesting over the last three years for the University to divest from companies such as Shell in light of the global climate crisis. Over the past few weeks they have held several rallies. Earlier this month, three students went on hunger strike whilst another group of student protesters occupied the University’s administrative centre, Greenwich House. Yesterday, the group dropped banners from bridges along the Cam and set off smoke bombs in a bid to raise a greater awareness of their cause. The forced eviction last Friday was carried out by company Constant & Co., which handled the controversial Dale Farm evictions in 2011. Writing on Facebook, Cambridge Zero Carbon claimed that, while “Management gave the impression that they were willing to meet, while actually pursuing court action” against students who were taking “proportionate action”. A spokesperson from Zero Carbon said that “we have resounding support on divestment and will win this debate”.